The life was uncertain, dream-like, with sharp contrasts of battle, pillage, murder, and flight. Zaporavo's red visions made it even more uncertain than that of the average freebooter. No one knew what he planned next. Now they had left all charted coasts behind and were plunging further and further into that unknown billowy waste ordinarily shunned by seafarers, and into which, since the beginnings of Time, ships had ventured, only to vanish from the sight of man forever. All known lands lay behind them, and day upon day the blue-surging immensity lay empty to their sight. Here there was no loot--no towns to sack nor ships to burn. The men murmured, though they did not let their murmurings reach the ears of their implacable master, who tramped the poop day and night in gloomy majesty, or pored over ancient charts and time-yellowed maps, reading in tomes that were crumbling masses of worm-eaten parchment. At times he talked to Sancha, wildly it seemed to her, of lost continents, and fabulous isles dreaming amidst the blue foam of nameless gulfs, where horned dragons guarded treasures gathered by pre-human kings, long, long ago. Apparently Paul Kearney has a similar outlook when it comes to rewriting history, since his latest book, The Ten Thousand (Solaris, 2008), is a retelling of historical events. More specifically it is the Anabasis of Xenophon, the story of a large mercenary army recruited to fight in Persia around 450 BC, and then left to fight their way home, transplanted to a fantasy world. On Kearney’s fictional world of Kuf, mankind shares the planet with two other humanoid species, the tall, yellow-eyed and gold-skinned Kufr and the yeti-like Qaf. The Kufr have the world-spanning Empire, and stand in for the Persians. The humans have a smaller continent to the West, and are called Macht. They are clearly Greco-Roman in culture, war-like, with city-states fighting amongst the ruins of a fabled empire of their own. As you might expect from a story based on history, there is little magic or fantasy aside from the setting. The Macht have some magical armor, supposedly derived from their gods, but that is about it. 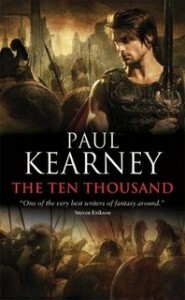 Some critics have compared Kearney to David Gemmell, but I think they are worlds apart. In a Gemmell book, virtue will always triumph, if at a cost. In Kearney’s work it is far less easy to tell where the virtue lies, let alone if it will win. The Macht mercenaries in this book, for example, are our protagonists, but they have come to a peaceful land for the express purpose of waging war on behalf of a usurper. When he dies in battle, the mercenaries try to broker a truce so that they can return home, but the emperor wants nothing but their destruction and treacherously assassinates the generals sent as ambassadors. It’s almost like Howard remarked about one of his Crusader stories, “all the characters complete scoundrels, and everybody double-crossing everybody else.” Well, not quite. Some of the characters have a sense of honor, insofar as their lives make it possible. I did not like this book as much as I enjoyed The Monarchies of God series, but it was well worth the time. Recommended for readers who enjoy the military fantasies of Glen Cook or David Drake. Interestingly, I learned the 1979 cult favorite movie The Warriors was also loosely based on the Anabasis, and director Walter Hill wanted to have the audience be aware of its Greek roots, but the executives said no. A remake is in the works, as if we needed one. The subgenre of modern fantasy with which Robert E. Howard is nearly synonymous died down in the mid-1980s but did not die out. Far from it; sword-and-sorcery proved to be as difficult to kill as many of its protagonists. But before we can celebrate Howard’s legacy by following the subgenre’s fortunes for the last several decades, we need to establish what we mean by sword-and-sorcery. For starters, what is meant at least for the purposes of this article is an approach to heroic fantasy that became aware of itself when Howard decisively expanded on the promise and premise of Lord Dunsany’s 1908 story “The Fortress Unvanquishable Save for Sacnoth” with “The Shadow Kingdom” in 1929. 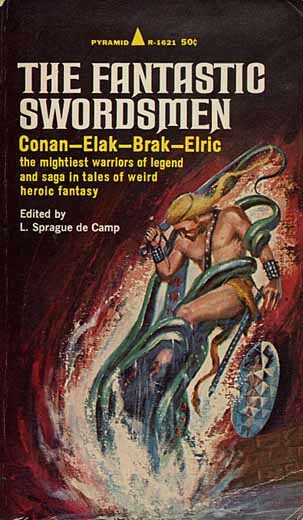 The verb “expanded” is chosen with no disrespect whatsoever intended toward Dunsany’s story; it is possible that during his much-debated involvement with sword-and-sorcery, L. Sprague de Camp never did the subgenre more of a favor than when he selected “The Fortress” for his anthology The Fantastic Swordsmen (1967).